Second District Rep. Erico Aristotle Aumentado filed a Bill proposing to reapportion the Province of Bohol into five legislative districts. 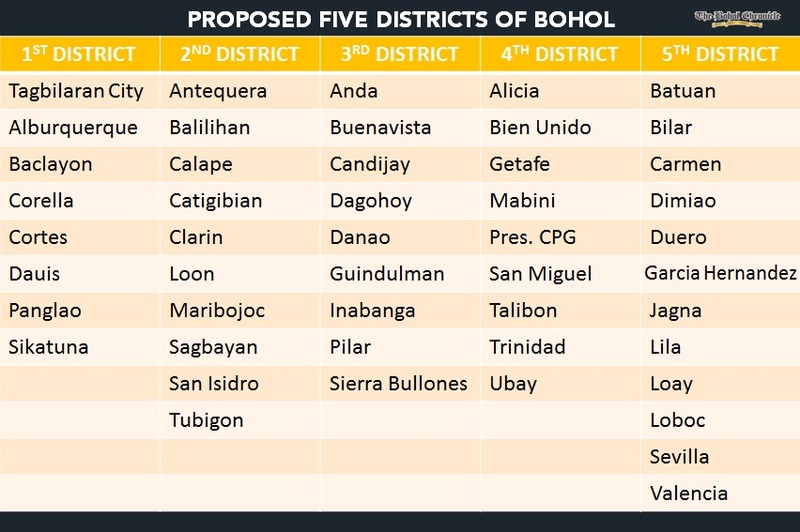 From the present three legislative districts, Aumentado said there is a need to reapportion the Province of Bohol into five districts as he “feels Boholanos deserve more projects considering the geographical size of the province and the increase in population”. In House Bill 7999 he filed on August 1, Aumentado proposed that the first district shall be composed of Tagbilaran City and seven towns which include Alburquerque, Baclayon, Corella, Cortes, Dauis, Panglao, and Sikatuna. The proposed new coverage of second district shall cover 10 towns which will include Antequera, Balilihan, Calape, Catigbian, Clarin, Loon, Maribojoc, Sagbayan, San Isidro, and Tubigon. Except Clarin, San Isidro, and Sagbayan, the rest of these towns belong to first district at present. The proposed new third district, to be composed of nine towns, shall include Anda, Buenavista, Candijay, Dagohoy, Danao, Guindulman, Inabanga, Pilar, and Sierra Bullones. Buenavista, Dagohoy, Danao and Inabanga are currently grouped with second district towns. The fourth district, to be composed of nine towns, shall include Alicia, Bien Unido, Getafe, Mabini, President Carlos P. Garcia, San Miguel, Talibon, Trinidad, and Ubay. Except for the towns of Alicia and Mabini which currently belong to third district, the rest belong to second district. The proposed fifth district, to be composed of 12 towns, shall include Batuan, Bilar, Carmen, Dimiao, Duero, Garcia-Hernandez, Jagna, Lila, Loay, Loboc, Sevilla, and Valencia. All these towns belong to third district at present. Aumentado explained that his intention in proposing to reapportion Bohol into five districts is “to see to it that more people benefit from government services”. He said “providing additional legislative districts will mean additional budget allocations for the province which in turn will boost the development in the countryside as more representations in Congress will mean more watchdogs and defenders to push for vital legislations that will spur development for the province”. In the Bill, Aumentado proposed that reapportioning of Bohol into five districts would commence in the next national and local elections after its effectivity into law. He also proposed that the incumbent representatives of the first, second and third district of Bohol “shall continue to represent their respective legislative districts until the new representatives shall have been elected and qualified.